Distribution: They are found today in almost all aquatic environments including hot springs, caves, within the water table, semi-terrestrial environments, in both fresh and marine waters, within the water column as well as on (and in) the substrate. In fact almost anywhere that's wet, even if only for a brief period! 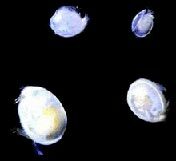 Description: Ostracods is a class of the Crustacea, sometimes known as the seed shrimp because of their appearance. Some 65,000 species have been identified, grouped into several orders. Typically they around one mm in size, but varying between 0.2 to 30 mm. An important distinguishing feature Ostracods share with other arthropods is the bilateral symmetry of their body form. They have an undifferentiated head, seven or less thoracic limbs and the bivalved, perforate carapace lacking growth lines.The paired body parts are enclosed in a dorsally hinged carapace composed of low magnesium calcite, which is what is commonly preserved in the fossil record. Ecology: Ostracods have a long and well-documented fossil record from the Ordovician period (approximately 500 million years ago) to the presen day. Ostracods sense their surroundings using sensilla (hairs or bristles) which project through the carapace via pore canals. Some shallow water ostracods have eyes and their carapaces have clear eyespots. Ostracods can reproduce either sexually and asexually including brood care of eggs within the carapace or producing desiccation-resistant eggs (known to survive in a dry state only to hatch on immersion in water years later and show sexual dimorphism, that is males and females of the same species have carapaces of differing size and shape.They grow by moulting up to nine growth stages. Some ostracods are filter-feeders, others are scavengers, detritivores, herbivores or predaceous carnivores. Some are parasitic or commensal on other crustaceans, polychaete worms, echinoderms and even sharks!.In the marine environment a variety of other crustaceans prey upon ostracods. Status: Long term studies indicate that changes in family and generic diversity in ostracods can be linked directly to changes in earths climatic history and especially such events as glacial change greatly affected species survival and biodiversity levels.